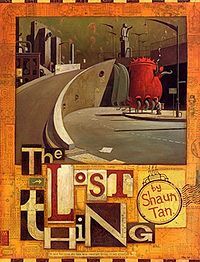 Normally I adore Shaun Tan, but this one didn’t work for me. I think it’s because the people were drawn in a way I didn’t like. They looked like we were meant to think of them as a mix between stupid and comic, and it was in a style I really dislike. Artwork in graphic novels is so important to me and makes up a huge part of why I do or don’t like a book. I’m sure the story was fine, but I was completely distracted by my dislike of the art. The Lost Thing was the last graphic novel on my TBR. Last year I started getting less and less fond of them and I doubt I’ll read too many more in years to come. Sad that my experience with them didn’t go out with a bang, though. This entry was posted in 2011, Children's, Visual and tagged mini-review, readathon, speculative. Bookmark the permalink.